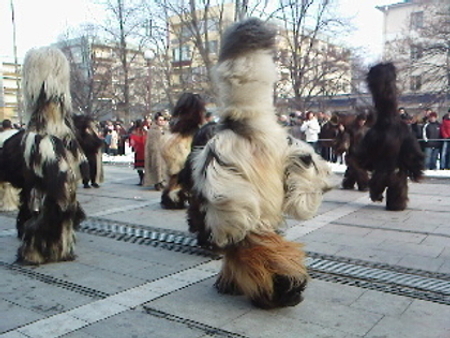 Kukeri or Surva Festival (Mummer's games) in the town of Pernik near Sofia, is the most spectacular "Kukeri" event in Bulgaria. At the end of January thousands of "kukeri" participants from different regions of Bulgaria, as well as from all around the world gather in Pernik for the three-day event. Kukeri is a pagan Bulgarian tradition of Thracian origins - in ancient times the old Thracians held the Kukeri (Mummers’) Ritual Games in honour of god Dionysus. The Kukeri games are performed by men only, dressed in colourful hand-made costumes and wearing scary masks. Each has also a leather belt around the waist with huge copper bells (chanove) attached to it. The Kuker's masks are decorated with threads, ribbons, laces and usually represent animals like goats, bulls, rams, or even chicken. Some of the masks are double-faced. On one of the sides, the nose is snubbed and the face is good-humored, on the other side, the nose is hooked and the face is ominous. Those masks symbolize the good and the bad which co-exist in the world. A very important thing for the symbolic meaning of the masks are the decoration colors. Red is the most used color - symbolizes fertility of the reviving nature, the sun and the fire; the black color represents Mother Earth and white is a symbol of water and light. The Kukers walk around, jump and dance special magic dances to scare away the evil spirits, to celebrate the beginning of the spring and hopes for a good harvest, health, land fertility, and happiness.